DOOP. That's the Philadelphia Union fan thing. I know, I know - It's silly. They play that horrible Doop, Doop, Doop song at their stadium, to no end, and they bombard Twitter with the #DOOP hash-tag. I got one for you, Doop boys! Wait for it, wait for it... #COOP!!! As in Kenny F'ng Cooooooooooooper!!!! The monster RBNY forward broke out of his two month, 625 minute, goal scoring drought with a double in this one, to hand the New York f'ng Red Bulls all three points and take them top of the East. King Kenny's performance, however, was almost overshadowed by the performance of Connor f'ng Lade. Our little big man was everywhere, fighting for every ball and had a hand in both of Cooper's goals. The afternoon did not start well as, 10 minutes in, Brandon Barklage suffered a strained hamstring. Barklage, who has been a revelation at right back, came out and the untried Johnny Borrajo replaced him. Borrajo, seeing his very first MLS action, held his own and gave us yet another example of how deep this Red Bulls team is this seaon. Newly acquired Red Bulls keeper Bill Gaudette was forced to make a fine save, while the score was still 0-0, and the half looked likely to end in doughnuts. Connor Lade, however, had other ideas. In the 43rd minute, Lade put in an inch-perfect cross to Cooper, who stuck it in, past the Union goalkeeper, for the first RBNY tally of the afternoon. In the 58th minute, Joel Lindpere stole the ball, in midfield, laid it off to LeToux who then laid it off to Henry. The legendary Frenchman sent it into space for Lade, who then passed it back to him. Henry then sent an inch-perfect cross of his own, right to the head of Cooper, who scored as if he was on the training pitch. Philly scored a stoppage time goal that was ruled offside by the linesman. On further review, the goal appeared to be legitimate, as Rocket Roy Miller looked to be keeping the Union forward onside. C'est La Vie DOOP Boys! But it would have been too little, too late anyway. Please see the video up top for pre-game and half-time comments and predictions. You can click here for post-game comments (as well as some great goal footage, courtesy of Curt Chaplin). Please click here for my photo album (slide show here). Another fantastic time @The Cathedral of Football for me. The weather was perfect - and we won! The South Ward brought the Tifos and the ruckus yest again. 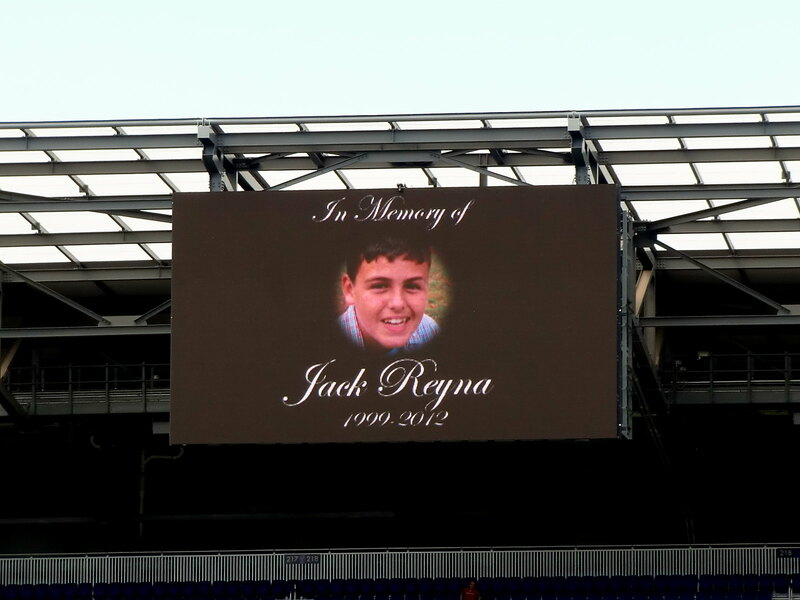 There were also some nice tributes to the late Jack Reyna, who recently lost his battle to cancer. 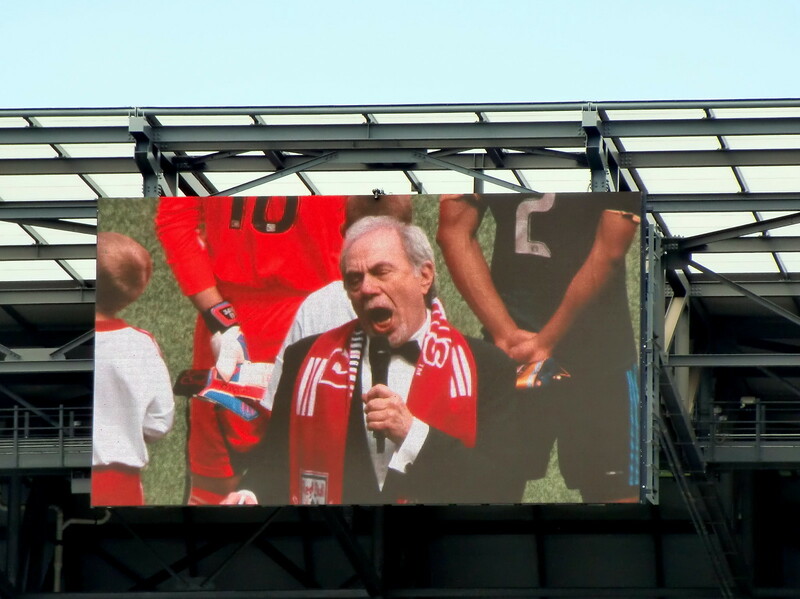 There was also a very intersting rendition of the National Anthem (by this guy) that defies description. That's it for me! Montreal away is next. Hope to see you all soon, @The Cathedral of Football, Red Bull Arena (built by Makita). Viper Out!